The Sock Knitting Class which started this week is off to a good start. Everybody got their socks cast on and is working on the toe increases. Your two socks are guaranteed to be the same length. You won't have that second sock syndrome trying to count rows and making sure to knit up a replica of the first sock. 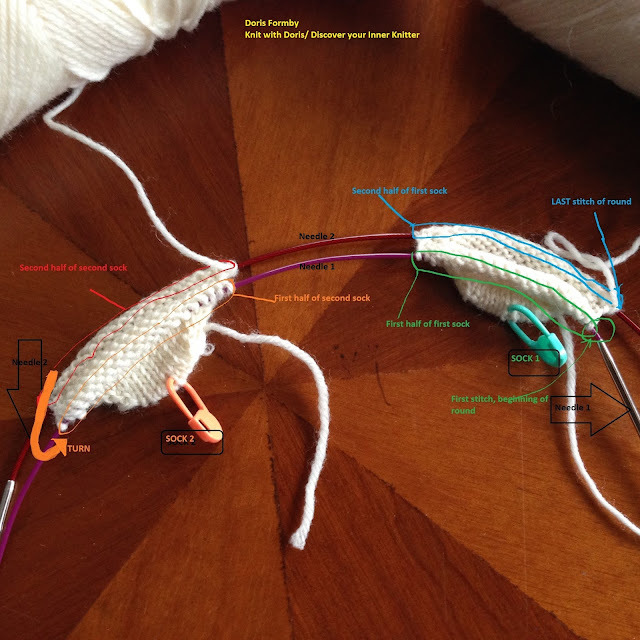 Also, working toe-up two at the time, you know how much yarn you have for the cuff. You won't be running out of yarn while knitting the foot and could make the cuff a little shorter or finish it with a different yarn. If you missed signing up for this class: I offer this class as private lessons or in a class when I have a group of at least two and no more than three. Please e-mail if you are interested. Set-up: Keep your yarn for sock #1 next to you on your right and keep your yarn for sock #2 next to you on your left. Step 1: Knit across the first half of the first sock. Step 2: Using your second ball of yarn knit across the first half of your second sock. TURN YOUR WORK ANTI- CLOCKWISE (your yarn will be criss-crossed for the second half of your round). Step 3: Knit across the second half of the second sock. Step 4: Using your first ball of yarn knit across the second half of your first sock. TURN YOUR WORK CLOCKWISE (your yarn is no longer tangled and you are ready for the next round). I will post some pictures of everybody's progress next week. After having knit the Ethereal Shawl in the Cascade Heritage Wave, I am now knitting up a shawl for the store in the same yarn. This shawl is crescent shaped and shows off the subtle color changes really well. The pattern I am using for this comes in three sizes and just one skein will make the smallest size (55"x 15").